But a number of PureVPN’s servers aren’t where they claim to be. The service is using what are known as virtual servers, which means a server that is supposed to be in the U.S. might actually be in Europe. It’s a complicated topic that we’ll get into in the trust section, but first let’s take a deeper look at PureVPN. 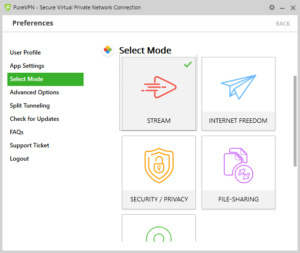 PureVPN’s interface is fairly easy to understand and uses a pretty common design idea for VPN desktop apps. You have a small window with a main panel and a left rail for navigation. Oddly, the settings option is in the upper-right corner of the window next to the minimize window option. 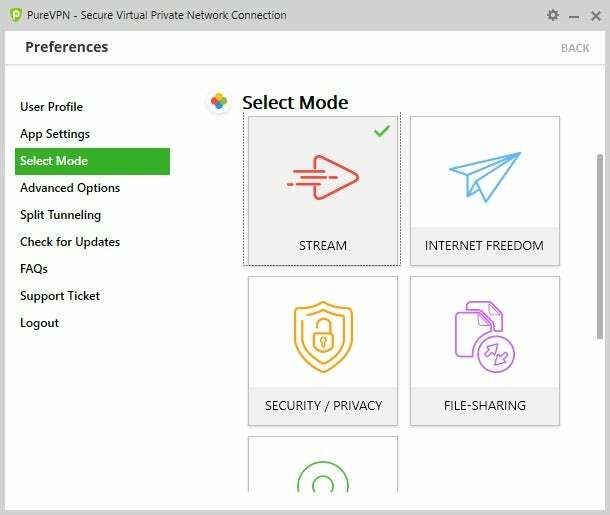 When you first sign in to PureVPN, it asks what kind of VPN usage you’re interested in such as streaming, Internet Freedom (i.e. defeating firewalls), security/privacy, file-sharing, or dedicated IP address. We saw similar first-time setup options from Romania-based CyberGhost. Presumably, these options are used to direct users to the servers best tuned for these specific purposes. Once you’ve chosen your desired usage, which you can change in the settings, you are confronted with the main interface. The left rail features just three options: Dashboard, Global Map, and VPN Hotspot. Dashboard displays your current connect/disconnect status, as well as the option to search for a specific location; you can also run a ping test to see the speed between your location and a VPN location; there’s also a Purpose option in Dashboard that helps you find a server for a specific use such as Netflix U.S. streaming, watching BBC iPlayer, or Sky TV Germany. In my tests, the Netflix U.S. streaming support was inconsistent. The Global Map option in the left rail is your usual map-based interface for choosing a country connection. PureVPN features a Hotspot option to share with other devices. 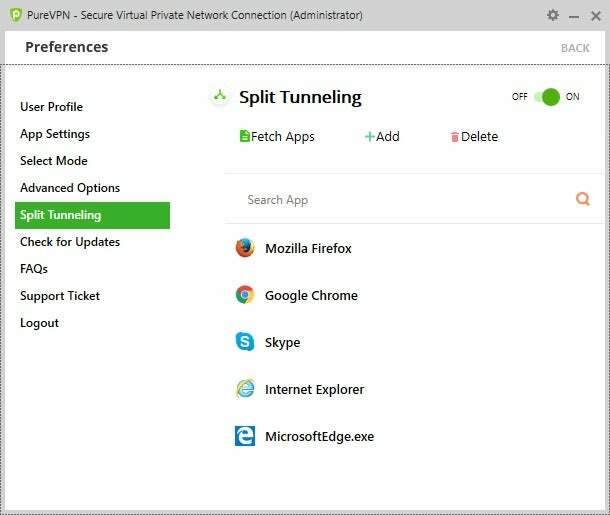 The last section in the left rail is VPN Hotspot, which lets your PC act as a VPN-enabled hotspot for all the devices around you. PureVPN’s interface is very simple and functional enough to get the job done, but it does have a few elements that detract from it. There are ads for its referral program, for example, at the top of the Dashboard section when connected to the VPN. There are also social media links at the bottom of the left rail that link to the company’s accounts on Facebook, Google Plus, Twitter, and YouTube. I suppose the social media links make it easy to try and get customer service help, but to my eyes they make the whole app look, well, cheap. For those who want to dive into the settings, there are a few options worth looking at. The App Settings can let you start up the app automatically—an option that is set by default—as well as launch your default browser after connection, or automatically reconnect if your connection drops. There’s also an option to ping servers once the app starts running. That last option is nice since it allows you to see at a glance how responsive a certain location should be before connecting. 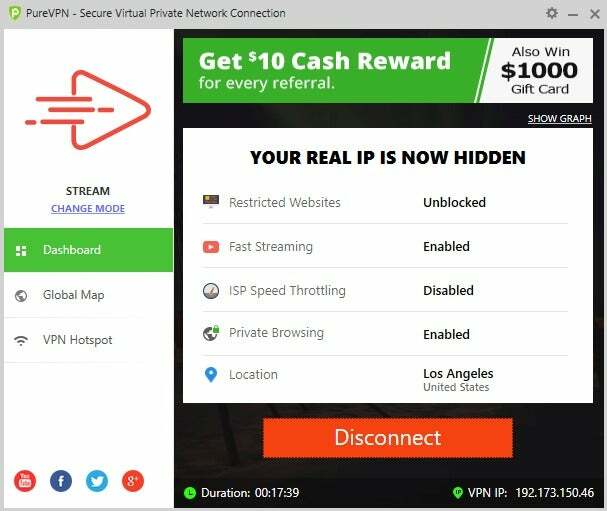 There are also some of the usual VPN features such as the internet kill switch that takes you offline automatically if the connection drops. 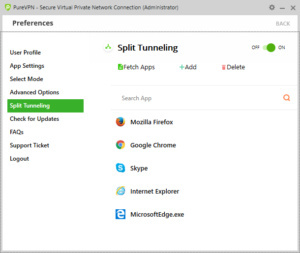 PureVPN also lets you use split tunneling, which directs specific programs to use the VPN connection and others to use your regular IP address that isn’t behind the VPN. This could be helpful if you want to use a VPN, but want to set aside a browser such as Firefox for use with Netflix. The thing about these power-user features is that you have to restart the app in administrator mode, which seems like overkill and an inconvenience. PureVPN has a refund policy, but be careful. It’s only good within seven days of your order or renewal date; you cannot use more than 3GB of bandwidth (that’s cumulative up and down); or exceed 100 VPN sessions. File sharing is allowed only in specific country locations, but that number is surprisingly broad at 107. 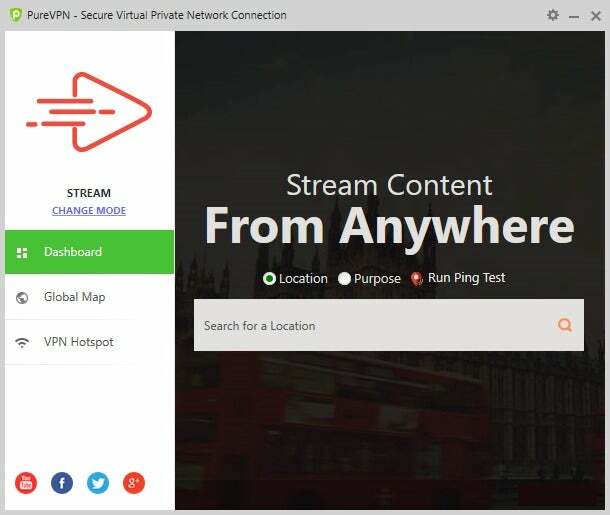 You will see a note next to a country connection when peer-to-peer is available, or you can see the complete list on PureVPN’s site. 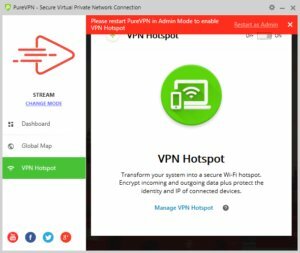 PureVPN offers apps for Mac, Windows, Android, and iOS, and it’s configurable with certain routers. There are also proxy add-ons for Chrome and Firefox. PureVPN’s overall average speed score was 31 percent of the internet connection’s base speed at the time of testing. That’s not bad and puts it in the same league with NordVPN and TunnelBear. As mentioned earlier, some of these servers may not have been where they claimed to be when I ran the speed tests. That said, the speed test did identify each server in its supposed location with a corresponding test server. As for the app itself, it’s a little laggy. I found that it would often freeze up or stall my system for a second, with that disappearing taskbar annoyance you sometimes see in Windows. This often happened for common operations such as minimizing the app to the system tray, or disconnecting from the VPN. 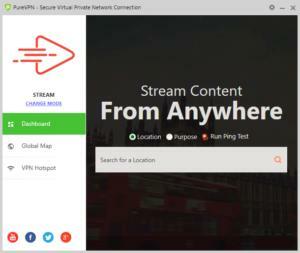 PureVPN recently came under scrutiny for running virtual servers that aren’t really in the location they appear to be in. In July, the website RestorePrivacy published a blog post looking at both ExpressVPN and PureVPN, reporting that several of the server locations for these services were not where they claimed to be. RestorePrivacy found five virtual server locations for PureVPN. Based on the site’s work, I ran some of my own tests on PureVPN servers, and I ended up with similar results, meaning there are quite a few more virtual locations than five. Servers in Ohio, for example, appeared to be closer to Vienna, Austria. While a server that was supposed to be in war-torn Syria was almost certainly in Frankfurt, Germany, and servers supposedly in mainland China (Beijing and Shanghai) were probably in Hong Kong. I say “probably” and “almost certainly” because without going to a data center to see the physical servers, we have to rely on ping tests and traceroutes as detailed in the RestorePrivacy post. Based on those tests, you can get a really good sense of where these servers are. Why, for example, does PureVPN’s Ohio server location take 94 milliseconds to hit a server in New York City, but only 9ms to connect to Vienna? Because the physical servers are closer to Vienna than New York. That sounds bad, but is all this enough to not trust PureVPN and the other services that also use virtual location servers? Maybe, but here’s the thing. Those virtual location servers still behave like they’re in the country they claim to be, serving up the appropriate location-based webpages. Plus in the case of PureVPN, the company is somewhat transparent about what it’s doing. There is a support page on the PureVPN site that explains its use of virtual servers. PureVPN also plans to denote virtual versus physical servers on its server listings page with a “VS” or “PS,” respectively, in the coming months. I asked the company why it felt virtual servers were a good thing for its users, but at this writing the company had not responded. Side note: As this appears to be an industry-wide trend, I plan on looking at VPNs we’ve previously reviewed to see who else is using virtual servers. Those that are will get an asterisk by their number of country locations at the top of the review. PureVPN lets you choose a specific use case for connecting. PureVPN is based in Hong Kong, which the company says is helpful since the semi-autonomous Chinese territory does not have mandatory data retention laws. PureVPN users should watch political events in Hong Kong closely, however, as this could change over time. PureVPN’s mailing address is listed on its website on the contact page as GZ Systems Limited, 36/F, Tower Two, Times Square, 1 Matheson Street, Causeway Bay, Hong Kong. This address is either a virtual location via some of kind of mailing service, or a shared office space, as a number of other companies use the same address. GZ Systems Limited is the company that owns and operates PureVPN. PureVPN doesn’t list its team on its website, but a little searching shows Uzair Gadit is the company’s co-founder and CEO. He also appears to be based in Pakistan—as does my PR contact—suggesting the company’s day-to-day operations may not be handled in Hong Kong. Perhaps that’s an unfair issue to point out as remote work is the beauty of this internet age—something I also enjoy. To sign up for PureVPN you need to supply an email address, name, and, in some locations, a phone number. Payments are accepted in a wide variety of forms including the usual credit cards, PayPal, and Bitcoin. As well as a host of other cryptocurrencies, and even gift cards from American retailers such as Walmart and Target via PayGarden.com. 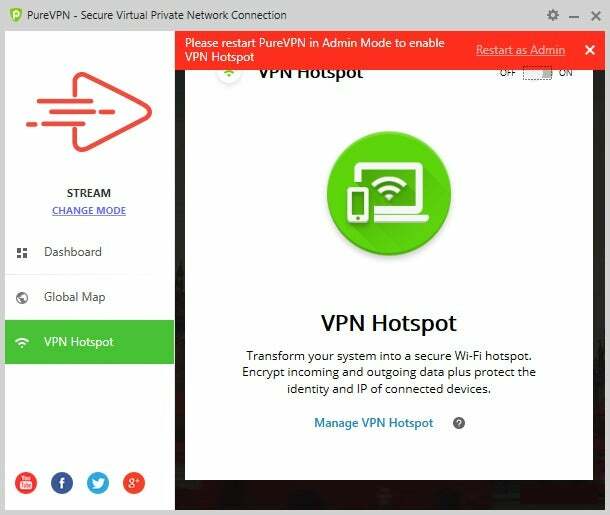 PureVPN has most of the features you need in a VPN. Its speeds are fine, it has a no-logging policy, accepts payments in various forms, and for those who need it, allows file sharing. The question you have to ask yourself is whether the virtual server locations are a problem for you. The company acknowledges on its site that it uses them and says it will be more up front about this in the future. Still, it’s important to know what you’re paying for when it comes to a VPN. 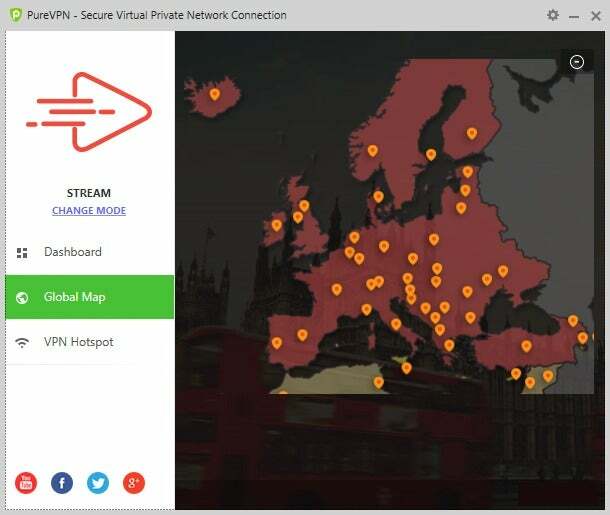 * PureVPN uses virtual servers meaning some of its country locations are not physically located where they appear to be.